Monochrome Monday Series | ft. Stampin' Up "Birthday Blooms"
So maybe it isn't a true monochrome because of the green, but then does gray really count as a colour? I'm counting it. This one is pretty straightforward, so I'll fill in with a little bit of an update. If you've been reading over the past couple weeks, you'll know that things have not been awesome. My impression as it stands is that things are getting better. But then I thought things were getting better before and boy was I wrong. It's a slow and incredibly hard road right now and honestly I have no idea what will happen at the end of it. There are still moments where everything is raw and painful but they're more manageable, they don't hurt less and it's always hovering right at the back of my mind, every now and then they'll resurface and it's hard to breathe. Card making and art has been a fantastic distraction so at least I'm not running out of things to blog. I would like to thank everyone who has been reading along and all the private well wishes you've sent. They mean the world to me. To begin, I stamped the large blossom from Stampin' Up "Birthday Blooms" with Memento Tuxedo Black ink on 110lb Copic-friendly cardstock. I wanted to go incredibly pale with this one, so I stuck with the lightest of the cool grays and only a touch of green. I adhered the panel to a slightly larger piece of grey cardstock and then mounted the whole lot to the front of a standard A2 sized card base. To finish off the card I used some Glossy Accents by Ranger to the centre of the flower and some iridescent sequins across the panel. I had considered not posting this. I didn't really look at the picture before I gave the card away, so I didn't have the option of taking a second one. I suppose I could have redone the card, but then I thought I'd keep the post and share a little something I learned about glitter pens. To begin, I stamped the rose image and the greeting from Clearly Besotted "Merci Beaucoup" with Memento Tuxedo Black ink on 110lb Copic-friendly cardstock. I coloured the image with Copic markers. To add some interest, I rounded the corners at the bottom of both the panel and the 4 bar card base. Finally I added a few mini diamonds from CTMH. Here's where I went wrong. I wanted the flower to sparkle. And not just a little bit. So I went over it when my clear Wink of Stella glitter brush pen. But because I'm me, and I can't stop myself - I waited until it was dry, then went over it again. Then again. And very possibly a fourth time; who's counting? Looking at the picture, you're all probably thinking "uh not your best colouring, Trina" - but no, that's just glitter. Lots and lots of glitter. So a couple things I learned from this: first, check the picture before giving away the card and second, maybe four or five layers of glitter is just a bit too much. So it sparkled. Like a whole lot and in real life it doesn't look this incredibly weird. Let's be honest as pictures go - this one makes up for every other one that I have ever posted where I said "the camera just doesn't pick up the shine". Getting to know myself has been one of the hardest things I have ever started to do. I say started because I spent a very long time putting my needs and dreams and wants last. Sounds funny? Maybe you're one of the lucky ones. My time as a stay at home mom over the last five and a half years had me making everyone but myself a priority. It's kids and husband and house first. Part of me is super excited to try and focus on me and see what it is that I want to do. I want to do something that makes me happy and I want to do something where I feel accomplished. You know what I'm saying. To begin, I masked off the front of a standard A2 sized card base and used Abandoned Coral and Wild Honey Distress Oxide ink to create the background. 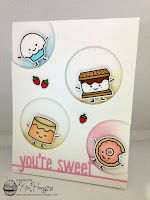 Once that was dry, I put the card base in the MISTI and stamped the image and greeting using CTMH Archival black ink. I love to use archival ink (and CTMH is my favourite) over the Distress inks because it is waterproof - so in the event that the coloured ink isn't completely dry the black won't run.